This is the largest and most comprehensive list of social media tools online. Trust me, I did some digging. Sure, there are countless lists floating around that have 10, 25, or even 100 social media tools listed. At best, you typically get the same top social media tools mentioned across these lists. But you and I both know that there are hundreds of other little known social media tools out there that can help with your social media marketing initiatives. However, who has time to curate all of these tools in one place? Lucky for you, I have compiled over 600 social media tools into a single list. So we’re off to a good start. See the Favorite Social Media Tools of over 100 Experts: I asked over 100 leading experts what their 3 favorite social media tools are – Click here to see what they picked. What I have found in list posts is that the longer the list, the more frustrated I get when endlessly scrolling to uncover a hidden gem that will do what I need it to. I’m sure you can agree that this is not the best use of your time. Instead of throwing out a bunch of links to tools in some random order, I have made it drop-dead simple to zero in on tools that will solve your pain points. Click here to go straight to the list of social media tools. What is the Definition of a Social Media Tool? Some things to note is that the term “social media tool” can be somewhat vague. What I mean is that even though a tool might serve a primary purpose for something else, it doesn’t necessarily mean it can’t be used to help your social media activities in some way. For example, one such tool is Google Analytics. While it is definitely not intended to be a social media tool, you can most certainly use it to more accurately track your social media initiatives. So please keep an open mind when sifting through these results. Whether most people admit it or not, you should be using various tools to help with your social media activities. By no means should you fully automate your social media presence, but you should look at ways to help streamline your efforts. The numbers for social media are staggering. Twitter recently published that they have 316,000,000 (that’s 316 million) monthly active users. That pales in comparison to Facebook which has 1,900,000,000 monthly active users. Yep, that’s 1.9 billion. Bottom-line is that no matter what your business has to offer, chances are that you can find your audience among the various social media networks. Of course your social channel focus will be influenced by your audience. If your business falls within one of these categories, you can have a good idea of where your competitors are focusing their efforts. You might choose to develop a presence on channels where your competitors are, which can be done with one of the many available social media tools for businesses to use. Or perhaps, you take a contrarian approach and go after a less saturated social media channel. No matter what social channels you want to be active on, to get the most out of your initiatives you will probably want consider a social media tool or two that will help you be more efficient. Unfortunately, there is not a single software or tool that can tackle all your needs on each social media channel. The good news is that with this list of social media tools having the ability to be filtered, you can easily narrow down the results. You’ll easily be able to see the different types of social media tools available. 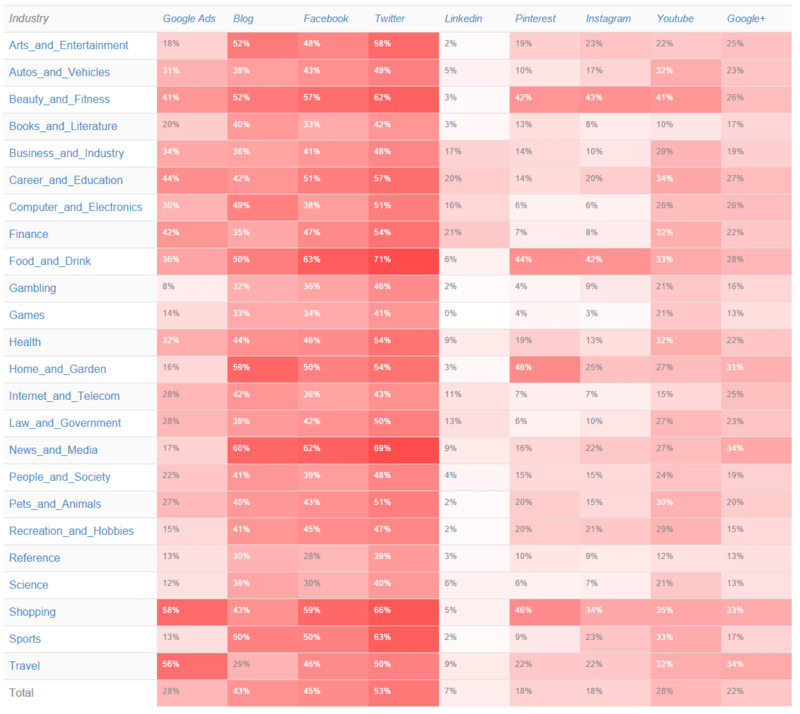 Many of these tools work across multiple social networks, which is not surprising. Out of this social media list of tools, we can see that the majority of them will work on Twitter and the fewest being Pinterest. Twitter has had an API open to developers for years, while Pinterest is just starting to roll out access to their API. Cost to use these tools vary. There will be some free social media tools, some are paid, and some offer both free and paid options. The majority of tools listed here do cost something to use. It takes a lot of time, resources, and money to put together many of these tools. As you can imagine, there are no doubt more tools that I have yet to find. So I can definitely use your help. If you know of a tool that is worth using and not on this list, please tell me about it here. I’ll be sure to check out the tool/service and update this list accordingly. If you happen to come across an item in the list that is inaccurate or incorrect, please let me know so that I can fix it. Many of these tools require paid access to use, and unfortunately I don’t have access to some of them to really know the ins and outs of them. So if you are a user of a particular tool, let me know if I described one incorrectly. I’d like to ask for your help in maintaining this list. Various social media tools come and go, and there’s nothing more annoying that clicking on a link to a tool to find out it is no longer available. So, if you come across a tool that has seen better days, leave a comment below and I’ll update the list. Don’t forget to leave a comment below about your favorite social media tools! P.S. You will be asked to sign in to List.ly in order to vote for your favorite tools – don’t worry it’s easy and you sign in using Twitter, LinkedIn, Facebook or Google+. Make better decisions faster with a mix of human and machine-learning capabilities using social media data streams. Quickly and easily edit your photos online. Monitor, measure, analyze, publish and take action on your social media activities. Have multiple users manage one Twitter account. Sombrero is your e-marketing coach. It will help you become an online marketing master. We provide you with one task a day. They take no more than 15 minutes, so you can do them wherever you want. End manual social media scheduling tasks. Forever. Bulkly recycles your social media updates and automatically sends them to your Buffer account. Create designs for Web or print: blog graphics, presentations, Facebook covers, flyers, posters, invitations and so much more. Social media marketing that helps you make better decisions through analytics, optimization and data-driven recommendations for Facebook, YouTube and Twitter. Get social media monitoring, analytics and management solutions for your social media initiatives. Create "click to tweet" messages in your content to help generate conversations on Twitter. Find the target audience for your business with Facebook Audience Insights. Queue up your social media updates to automatically publish at the times you want. 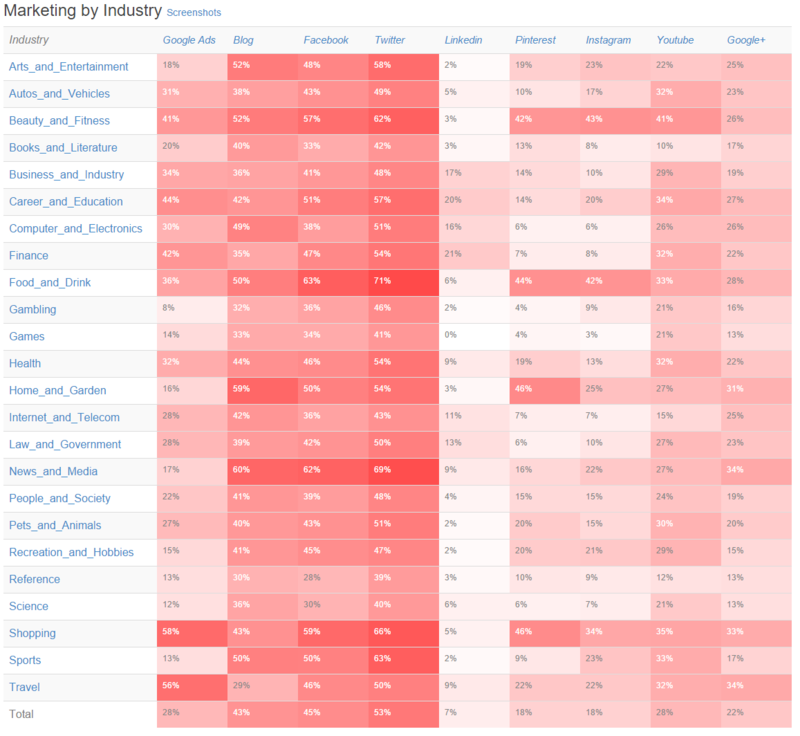 Find the most popular content for any topic along with the social influencers who share it. Complete social media aggregator that pulls in feeds from Twitter, Facebook, Instagram, YouTube, and Reddit AMAs. Real-time hashtag tracker for Twitter, Instagram and Facebook that has a simple and beautiful visual dashboard. Social media management software that is designed to publish social messages, interact with prospects and generate more leads. Everything you need to provide great social customer service. Pinterest Marketing, Analytics and Management toolset, trusted by over 35,000 brands. Manage Pinterest marketing with free pin scheduling and pinterest analytics. Get an update when someone's bio or profile picture has changed. Create shortened links that can be tracked on your social media updates. Video chat with 4 people at a time. Save and replay on your favorite social media channels. Automatically create a Gmail signature and add it to your emails and include your social media links. Publish polls, offers, and other content to drive brand engagement, measure conversions, and manage social presences at scale—all from one easy-to-use platform. Check for your brand, trademark, product or user name on 160 Social Networks in one of the most popular username checkers. Allow for comments and discussions on your blog through the use of social media sign-in.